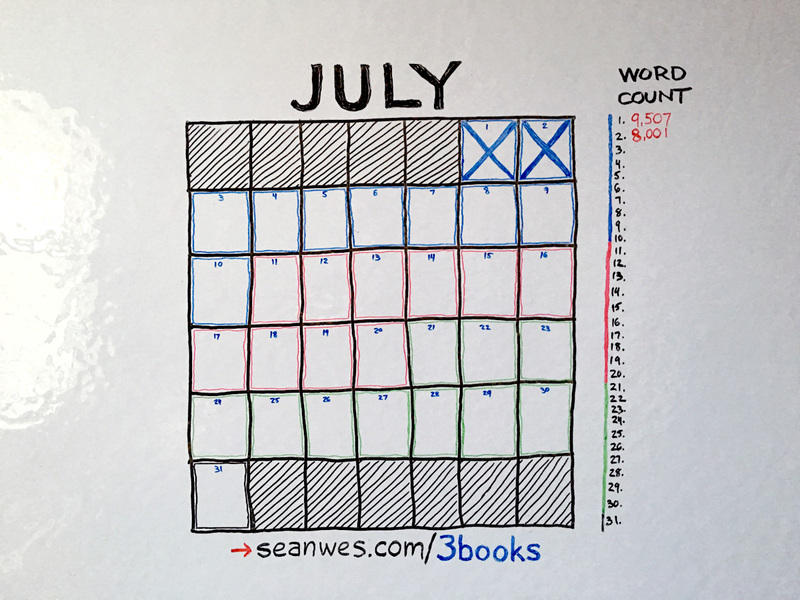 Yesterday, I pushed myself too much with setting up live streaming and writing a big Day 1 journal entry along with an intense first day of writing. As a result, I ended up going to bed later and that really threw things off. I got up at 6:00am instead of 4:30am and even still I was really tired. Note to self: DO NOT mess with the night time routine. Don’t do it! A successful day starts the night before and I pushed myself too much trying to do all of the things. I am glad I had live streaming set up now though because it’s much easier to do my nightly recap. There’s very little setup to do and I’m really enjoying it as a fast way to create content. Oh, good news! My wrist did not hurt this morning. I’m very grateful for that. Today was extremely tough. I found it tremendously hard to focus. I wanted nothing more than to sleep this morning. I usually have coffee around mid-day as a pick-me-up since I let my body’s natural cortisol do it’s work. But today, I was not going to last that long and had my coffee around 9:30am, which is earlier than usual for me. Even though I started a little after 6am, I had only written 1,800 words by 9:30am. The words were coming slowly and it didn’t get better. I barely broke 4,000 words by 2pm. That’s the halfway point and well over halfway into the day. Not good. I took a break. It was taking the break that made me realize I hadn’t really taken any purposeful breaks up to this point. I allowed myself to check my phone while I ate some breakfast, but other than that I’d just been pushing myself. The words I’d written had been good—really good actually. But the word count was mocking me. Part of the problem is that I wrote a lot of things and then removed them. So I probably wrote way more than the total shows today, but I deleted lots. Yes, I was editing as I writing and that’s a no-no. I myself preach against this, but admit it’s very hard to resist in practice. On this break, I talked with my wife. I told her how it felt like I was banging my head against a wall all day. She told me to try writing on another topic. At that point, I realized I’d been drilling on a single topic for the entire day. It was draining me. I had a lot to say, but after 3,000 or 4,000 words on a topic in a single sitting, it starts to wear on you. It seems obvious. It’s okay to jump around. You don’t have to write your book linearly. In fact, you shouldn’t! But for some reason I felt like to do so would be hitting snooze on the hard work. I know that sounds strange, but let me explain my thought process. Remember, this is my journal. I’m shooting for roughly 80,000 words and 20 chapters. That’s 4,000 words a chapter per book. It seems like it would be easy in the beginning to bounce around from topic to topic. 2,000 words here, another thousand there, 1,500 words in another place, and 500 words for good measure. In my mind, that would make hitting the 8,000 word goal very easy in the first half of the 10 days I’ve allotted to writing each book. But once I get towards the end of the time frame, I would have 20 partially completed chapters. Bouncing around would then no longer be a luxury but a forced reality. Hitting 8,000 words a day at that point would be very difficult given that I’d have to write on many topics with each one already having a partially written chapter. That means most of the good things I wanted to say will have already been written and I’ll be struggling to come up with more. So I figured it was going to either be a struggle later or a struggle now and decided to just write entire chapters in one sitting. This proved to be incredibly intimidating. It was hard to focus, I found it difficult to keep pushing on the same topic, I was tired and wanted to rest, the words were coming slowly, and it was mid afternoon and I was only halfway to my goal. You now understand how disheartened I felt. I shared all of my concerns and struggles with my wife. We talked through it and came up with a plan that ended up working out really well. I allowed myself to work on up to two other chapters in the same day, but the rule was that they had to be within two chapters of the one I was working on. This turned out to be very helpful as it allowed me to keep my frame of reference and still generally work in a linear fashion while giving me enough freedom to move around and prevent fatigue. I ended up writing two very big chapters today—one of which I think will end up being the single best chapter of the first book, if not the entire trilogy. Once I came back from the break with this new plan and a little extra freedom, the words started flowing. It was still late in the day though, so I had to push really hard. I wrote 8,001 words today, hit my goal, and I’m very happy about that. Getting things started may be the hardest part, but boy is keeping things going hard too. Yes, I was having trouble writing, but I think one of the biggest factors was the late night last night. I can’t afford to mess up the sleep schedule. Tonight, I’m going to be militant about going to bed on time. In bed by 10pm, asleep by 10:30pm. I didn’t run this morning. I really needed the sleep today after the late night. I was also already considering not running on the weekends—partially because I wanted a break, but also because people were telling me it’s not good to run every day of the week without ever taking days off. But then I asked the runners in the Community and the responses were mixed. Some people say you should take days off, but others said running every day is fine and your body recovers fast, it’s not too intense to run every day, and it’s good for you. I think I’m going to keep running. I may take breaks if I need to, but only if I need to. Right now, I feel really great during the day when I’ve run in the morning—both mentally and physically. So I want to keep that up. I don’t actually like the act of running at all, but like waking up early, I don’t do it because I enjoy it. I do it because I like who I am when I do.